→ Since early times human beings have been trying to understand their nature. Early Indian philosopher classified matter into five basic elements. the“Panch Tatva”– air, earth, fire, sky and water. According to them, living as well as non living things are made up of these elements. → Now a days, scientists evolved to types of classification of matter – physical properties and chemical nature. → Matter is made up of particles. All matter constitute of very small particles. These small particles are called atoms. → These particles of matter are too small so they cannot be seen by naked eyes or simple microscope. → Particles of matter are continuously moving as they posses kinetic energy, with the increase of temperature kinetic energy of particles also increases so particle moves faster. 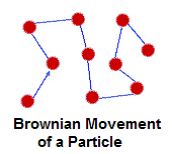 → Brownian Motion: The zig-zag or random path travelled by the particles of matter is called Brownian motion. → Intermixing of particles of two different types of matter on their own is called diffusion. The rate of diffusion increases on increasing the temperature of the diffusing substance (by heating). It is natural process. It takes place in solid, liquid and gas. → Gas can be compressed a lot because of the space between their particles. → When sugar is dissolved in water, the particles of sugar disappear in water. This happens because particles of sugar get adjusted in the spaces between the particles of water. Additionally you will notice that there is no rise of water level takes place when one or two teaspoon of sugar is added in a glass of water, this is because sugar particles get adjusted in the space between the particles of water and no rise in the water level comes in result. → Force of attraction between particles of matter keeps the particles bonded together. The force of attraction between particles of solid is greatest, between particles of liquid is moderate and between particles of gas is lowest. → Because of the lowest force of attraction between the particles of gas we can move our hand through air easily. To move our hand in liquid, such as water, we have to apply some force, but from a solid such as wood, we cannot move our hand. →This is because the force of attraction between particles of gas is almost negligible, in liquid the forces of attraction is moderate but it is greatest in solid. → The space between the particles is very less. → The force of attraction between the particles is strong. Thus, particles in a solid are closely packed. → Solids maintain their shape even when they are subjected to external force i.e. they are rigid. → Solids cannot be compressed. → The kinetic energy of the particles is very less and so solids have an orderly arrangement of the particles.Therefore, solids have a fixed shape and volume. → The space between the particles is slightly more as compared to solids, but still very less as compared to gases. The particles of a liquid can slip and slide over each other. → The force of attraction between the particles is strong enough to hold the particles together but not strong enough to hold the particles in a fixed position. → Liquids do not have a fixed shape but have a fixed volume. Liquids take up the shape of the container in which they are poured. → The kinetic energy of the particles is more than that of solids. Thus, liquids have a disorderly arrangement of particles compared to solids. → Liquids cannot be compressed much. The compressibility of liquids is almost negligible. → The particles are much farther apart from one another as compared to solids and liquids.They have a very disorderly arrangement of particles compared to the solids and liquids. → The force of attraction between the particles is negligible, hence particles of a gas move freely in all the directions.Gases thus can mix or diffuse into other gases. → The particles of a gas have maximum kinetic energy. They move with high speed in all directions and can exert pressure on the walls of its container. → Gases neither have a definite shape nor a definite volume.They fill up the container completely. → Gases can be compressed easily. Example: the LPG cylinders used at home and the CNG cylinders used in vehicles. → The phenomenon of change from one state of matter to another, and then back to the original state is called the interconversion of states of matter. → On increasing the temperature of solids, the kinetic energy of the particles increases which overcomes the forces of attraction between the particles thereby solid melts and is converted to a liquid. → The temperature at which a solid melts to become a liquid at the atmospheric pressure is called its melting point. The melting point of ice is 273.16 K.
The process of melting, that is, change of solid state into liquid state is also known as fusion. latent heat. Since, the heat energy is hidden in the bulk of the matter, it is called latent heat. → The heat energy required to convert 1 kilogram of a solid into liquid at atmospheric pressure, at its melting point, is known as the latent heat of fusion. → The temperature at which a liquid starts boiling, at atmospheric pressure, is called its boiling point. → The process, in which a gas, on cooling, turns into a liquid at a specific temperature is called condensation or liquefaction. Formation of clouds is due to the condensation of water vapour from the Earth’s surface. → The change of state of a substance directly from a solid to gas, without changing into the liquid state (or vice versa) is called sublimation. → The temperature at which the state of a substance changes from a liquid to a solid is called the freezing point of that substance. hidden into the contents of the beaker and is known as the latent heat. particles in steam have absorbed extra energy in the form of latent heat of vaporisation. → Gases can be liquefied by applying pressure and reducing the temperature. When a high pressure is applied to a gas, it gets compressed and if the temperature is lowered, the gas is liquefied. → Solid CO2 gets converted directly to gaseous state on decrease of pressure to 1 atmosphere without coming into liquid state. This is the reason that solid carbon dioxide is also known as dry ice. → The process of conversion of a substance from the liquid state to the gaseous state at any temperature below its boiling point is called evaporation or vaporisation. → Evaporation is a surface phenomenon. → The rate of evaporation increases on increasing the surface area of the liquid. → The rate of evaporation increases with an increase in temperature. → Decrease in the humidity increases the rate of evaporation. → An increase in the wind speed increases the rate of evaporation. → The particles of liquid absorb energy from the surrounding to regain the energy lost during evaporation. This absorption of energy from the surroundings make the surroundings cold. → Lately, scientists are talking about five states of matter or five phases of matter. These are-solids, liquids, gases, plasmas and the Bose–Einstein condensate. The state consists of super energetic and super excited particles. These particles are in the form of ionised gases. The fluorescent tube and neon sign bulbs consist of plasma. → Indian physicist Satyendra Nath Bose made a study regarding the fifth state of matter. Based on his study, Albert Einstein predicted a fifth state of matter called the Bose-Einstein Condensate. → The Bose-Einstein Condensate or BEC is formed by cooling a gas of extremely low density to super low temperatures. → The SI unit of mass is kilogram (kg). → The SI unit of volume is cubic metre (m3). The common unit of measuring volume is litre (L) such that 1L = 1 dm3, 1L = 1000 mL, 1 mL = 1 cm3. Celsius scale to the Kelvin scale you have to add 273 to the given temperature. → Atmosphere (atm) is a unit of measuring pressure exerted by a gas. The unit of pressure is Pascal (Pa): 1 atmosphere = 101325 Pa. The pressure of air in atmosphere is called atmospheric pressure. The atmospheric pressure at sea level is 1 atmosphere, and is taken as the normal atmospheric pressure.